I think we'll wrap up the Halloween weekend with some scary-funny stuff. First up, over on MentalFloss.com, "18 Terrifying Old Costumes You Can't Unsee." Unsee more here. Also, on the SA Wardega YouTube channel, check out his "Mutant Giant Spider Dog." Enjoy. 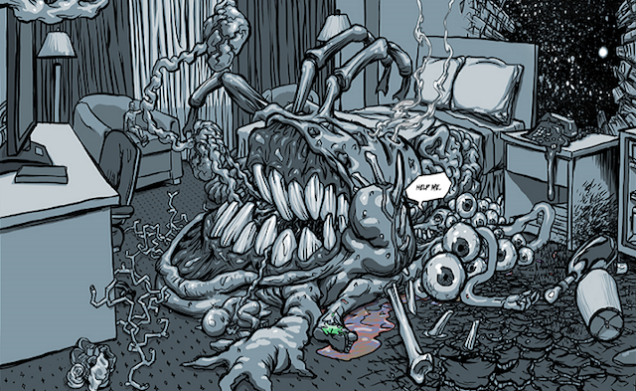 Finally, io9.com was kind enough to pass along "Tons Of Horror Webcomics To Terrify You This Halloween." See more here. From the BuzzFeedYellow YouTube channel, something I just spotted on a new Friend's Timeline . . .